In this post, we’re going to show you all of the elements that make up a good mobile friendly website. We’ll also share the tools that you need to get your site optimized for mobile. 60% of searches are being performed on mobile devices. This means that, if your website isn’t formatted to adapt to those devices, you could be alienating 60% of your potential search traffic. Is this an exaggeration? Does mobile really matter to your small business website? All the way back in 2015, Google did something pretty unusual. They announced a major update… and gave specific guidance and direction about the update. In fact, they even built a tool to help people prepare for it. An algorithm update that explicitly gives priority ranking to mobile friendly websites. Mobile search has been on the rise for years and, now, more of Google’s searches are done on mobile devices than desktop devices in over 10 countries – including the United States. Yet, despite the heads’ up, still more than 40% of Fortune 500 sites failed Google’s mobile friendly test as of the roll-out date. In our own study, which reviewed local businesses in Lansing, Michigan, we found that number to be north of 60%. Google’s algorithm is designed to prefer websites that work better on mobile devices. They want to ensure that people find their results useful, and if they’re prioritizing results that people have difficulty accessing from their phones or tablets, it reflects poorly on them. And given how crucial search is to their > $40B bottom line, how people search is a metric they pay a lot of attention to. And it didn’t stop in 2015 at mobile friendly web design, either. In 2018, Google announced a whole new metric for judging mobile friendliness: speed. Google is explicitly adding speed as a ranking factor to all mobile searches in July of 2018. This is a response to the fact that mobile search has been becoming more and more important to users, taking precedence over desktop searches by 60% over the past few years. And many mobile sites are slow. The fact of the matter is, 53% of visitors abandon a website if the load time is longer than three seconds. The average mobile website? It takes 22 seconds to load. On average, 1.5MB can take 7 seconds to load on a fast 3G connection, and 70% of pages are greater than 1MB in size, most websites move slower than desired. As page load time goes up (from 1 second to 7), the probability of a mobile visitor “bouncing” from the site increases by 113%. What this looks like practically? So Google will be ranking faster mobile friendly websites, (the ones people are less likely to leave before they finish loading,) higher than the slower ones. Obviously, everyone wants to rank well in Google. But is there any other reason to put in the time, money and effort to make your website mobile friendly? If you want your business to be seen as legitimate as your competitors, then yes. It used to be the case that business owners only had to worry about one or two (probably, local) competitors. Meanwhile, services like Thumbtack, while they can be great for gathering reviews and demonstrating social proof, ultimately serve to commoditize local businesses. They often compel those business owners to drive customer traffic through price reductions and discounts, rather than engaging their customers with a more significant value-exchange. Plus, they charge you to be on the platform! With customers having access to more options and more information, it’s hard to stand out. Trying to compete without an optimized mobile friendly website is like fighting with one arm tied behind your back. The last time I went to buy a car? The dealer already had the Carfax out. Why? Because so many people come in with their research already done. True to form, I myself had come in with data from Truecar, which I intended to use as the basis for my negotiation. And, when I went in, you better believe that I expected the dealer to defend his truth and expertise against my own research and data. Even doctors aren’t above the fray: they now have to deal with patients who come in telling them what treatment they need, because of what they had read on WebMD! The point is that today’s customer is informed. They do research before they walk in a store, pick up a phone, enter a live chat, or send an email. Either way, if they’re going to work with you – or even consider working with you – they will absolutely visit your website as part of their research. Oh, how the web has evolved since the nineties. As software, social media, and the web has advanced, important design paradigms have started to emerge as “best practices,” not simply because of their aesthetics, but because thousands of people have spent millions of hours testing and architecting user experiences in order to understand how people interact in digital environments and optimizing those experiences to influence behavior. Everything from hue and font size to page load times has been – and will continue to be – studied. Which means that before people even visit your site, they’re bringing with them – often in the back of their minds – the thousands of other sites they’ve visited in their lifetime and subconsciously comparing your site to those other ones. And, if they don’t approve of your site, they bounce. It’s even worse on mobile, where customers spend the vast majority of their time. In fact, more than 48% of people go so far as to assume that if you don’t have a mobile friendly website, then you don’t care about your business. How’s that for rash judgement? Now, we business owners know that there isn’t really a correlation between how much we care about our businesses and the quality of our websites. Many business owners have dated websites. Not because they don’t care, but because it’s been hard for them to find reliable, affordable, responsive web developers. After all, we have a million other things to do just to manage our businesses effectively! Still, the addition of new, technological pressures, the changing attitudes of consumers, and the perceptions they bring with them mean that we need to be thoughtful in our approach to attracting new customers online. That is, if we want our businesses to flourish. Given the preeminence of mobile search and Google’s insistence on mobile-friendliness as a significant ranking factor, it seems that investing in a mobile friendly web design is a good place to start. Okay, so mobile matters. How can you improve? Is there a universal mobile friendly website tutorial? We’re going to show you all of the elements that make up a good mobile friendly site. And, we’ll share the tools that you need to get your site optimized for mobile. First off, you can use Google’s Mobile Friendly Test tool. Head over to Google’s Mobile Friendly Test and put your website in it. Print or save the results to give you a reference point for how to think about mobile for your website. Go through this checklist and polish up the elements contained within it. Then, open your site up on your phone or tablet and see how it really looks! It will take some trial and error, but the results will be more than worth it. Okay, so it’s easy to say “make your website faster.” But what does that actually look like? And can you even test your site to see where you rank? Well, sort of. There isn’t a cut-and-dried way to know exactly where you rank when it comes to your mobile speed. But keep in mind: these changes only impact mobile searches, and they are targeted toward the worst offenders on the load time scale. So the best way to ensure that your ranking isn’t adversely effected is to make sure the elements of your page load quickly and efficiently. These things, we can test. Using tools like Pagespeed Insights, Lighthouse Chrome DevTools, and Testmysite, you can get an idea of how well your website is performing, and whether you need to optimize your pages for speed. Make sure the HTML, CSS, JS coding for your pages are optimally compressed to cut the fat when it comes to file size. A well-compressed page will load much quicker than one that isn’t. Something else to consider: lazy loading. This means holding off on loading images until the visitor actually hits the section of the site where the images are located. For example, if there’s an image at the bottom of a page– it won’t be loaded until the visitor scrolls down to that section of the page. Since it delays loading the content until the user scrolls to it, it reduces the initial file size of what must load, without actually eliminating any content. This will make a huge difference in the initial load time. If you have a blog, consider moving your content over to Google’s accelerated mobile pages (AMP) to help increase speed. This won’t be a night-and-day difference when it comes to your ranking, but Google does tend to favor AMP content when given the chance. The more content you have on a page, the longer it will take to load. This means being smart when it comes to what content you put where. That being said, good content will always help your site. Even if it’s slow. Getting rid of relevant and helpful content is never a good idea, so don’t try the slash and burn approach. We’re going for efficient content, not less content. As we mentioned before, a key factor in staying on top of your site’s speed is monitoring it with tools like the ones mentioned above. If your site isn’t performing well in these tools, check to see where it’s falling short and get back on track. Mobile ads can be a disproportionately cheap means of advertising, and a great way to generate new customers. But if your pages are slow, expect to see an increase in your pay-per-click rates, or even have your ads fail to be served. Google doesn’t want to send traffic to slow sites that visitors are likely to bounce from, even if you’re willing to pay for that traffic. So to reap the benefits of mobile advertising, be sure to follow the above tips and get your website moving efficiently. A Mobile Friendly Website… Now What? 40% of mobile searches have local intent. Those are people looking to purchase something or locate a business in their area. That’s a huge factor when it comes to driving traffic to small businesses. So how can you harness the power of those searches and optimize your site for mobile speed ranking? We hear a lot of excuses for avoiding this, but there are plenty of reasons to stay up to date on website maintenance. Like any aspect of your business, there’s no set-it-and-forget-it option. Investing in regular maintenance can protect you from major security breaches… and overhauling an outdated site, like you just did to get it mobile friendly! You’ve heard it said plenty: content is king. (We’ve talked about that in our post on 2018’s tech trends.) A mobile friendly website is awesome, but it isn’t worth much if you aren’t posting content and staying relevant to your industry and your potential customers. Seem overwhelming? Rely on the Pros. Sign up for a free website review and let us optimize your site for mobile devices. We can take on your website maintenance and business blogging, too! Want to improve your rank in Google? 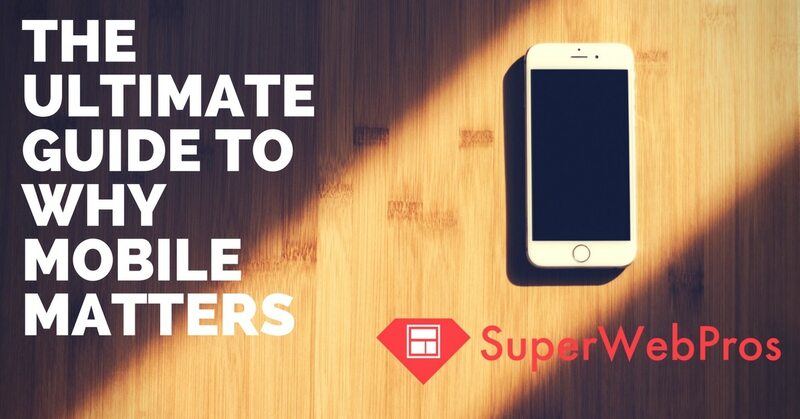 Follow this Ultimate Guide and get a mobile friendly website today.